Alarm fatigue or alert fatigue occurs when one is exposed to a large number of frequent alarms (alerts) and consequently becomes desensitized to them. Desensitization can lead to longer response times or missing important alarms. Alarm fatigue occurs in many industries, including construction and mining, healthcare, and the nuclear power industry. Like crying wolf, such false alarms rob the valid alarms of the value they were intended to add. Residential burglar alarms can be caused by improper arming and disarming of the system, power outages and weak batteries, wandering pets, and unsecured doors and windows. In the U.S. false alarms cost police agencies up 6.5 million personnel hours, according to the International Association of Chiefs of Police. 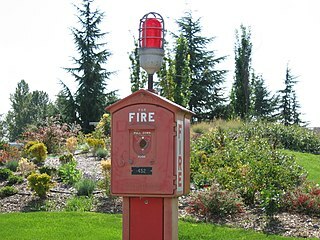 A 2002 study by the U.S. Justice Department estimated the cost of false alarms to be as high as $1.5 billion. Due to this cost, many cities now require permits for burglar alarms, have enacted verified response protocols, or have introduced fines for excessive false alarms. If a power outage occurs on system with a weak backup battery it can cause the alarm to trigger. Preventing this type of false alarm requires alarm owner to periodically replace the backup battery. Most people should have surge suppression on the AC power as well as the RJ31X area. If properly installed, the surges should bypass the system. So to help prevent a feedback loop up case ground, never install the RJ31X surge suppression inside the burglar alarm panel, and only ground it to the ground lug of the AC surge suppression. To even reduce more false alarms, tie three to four knots in the phone line between the RJ31X Surge suppression and the panel as well as three to four knots in the low voltage AC power source feeding the panel after the AC surge suppression. In industrial alarm management, a false alarm (nuisance alarm) could refer either to an alarm with little information content that can usually safely be eliminated, or one that could be valid but is triggered by a faulty instrument. Both types are problematic because of the "cry wolf" effect described above. A surge protector is an appliance or device designed to protect electrical devices from voltage spikes. A car alarm is an electronic device installed in a vehicle in an attempt to discourage theft of the vehicle itself, its contents, or both. Car alarms work by emitting high-volume sound when the conditions necessary for triggering it are met. Such alarms may also cause the vehicle's headlights to flash, may notify the car's owner of the incident via a paging system, and may interrupt one or more electrical circuits necessary for the car to start. Although inexpensive to acquire and install, the effectiveness of such devices in deterring vehicle burglary or theft when their only effect is to emit sound appears to be negligible. An arc-fault circuit interrupter (AFCI) also known as an arc-fault detection device (AFDD) is a circuit breaker that breaks the circuit when it detects an electric arc in the circuit it protects to prevent electrical fires. An AFCI selectively distinguishes between a harmless arc, and a potentially dangerous arc. Motion detection is the process of detecting a change in the position of an object relative to its surroundings or a change in the surroundings relative to an object. Motion detection can be achieved by either mechanical or electronic methods. When motion detection is accomplished by natural organisms, it is called motion perception. A fire alarm control panel (FACP), fire alarm control unit (FACU), or simply fire alarm panel is the controlling component of a fire alarm system. The panel receives information from devices designed to detect and report fires, monitors their operational integrity and provides for automatic control of equipment, and transmission of information necessary to prepare the facility for fire based on a predetermined sequence. The panel may also supply electrical energy to operate any associated initiating device, notification appliance, control, transmitter, or relay. There are four basic types of panels: coded panels, conventional panels, addressable panels, and multiplex systems. Manual fire alarm activation is typically achieved through the use of a pull station or call point, which then sounds the evacuation alarm for the relevant building or zone. 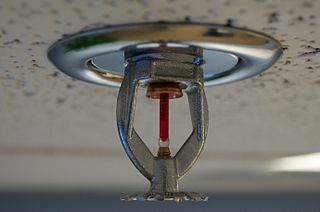 Manual fire alarm activation requires human intervention, as distinct from automatic fire alarm activation such as that provided through the use of heat detectors and smoke detectors. It is, however, possible for call points/pull stations to be used in conjunction with automatic detection as part of an overall fire detection and alarm system. Systems in completed buildings tend to be wired in and to include a control panel. Systems for use during construction can also be wireless or mechanical, however it is recommended by the Structural Timber Association in the UK that for timber-framed constructions, interconnecting wireless systems be used. A heat detector is a fire alarm device designed to respond when the convected thermal energy of a fire increases the temperature of a heat sensitive element. The thermal mass and conductivity of the element regulate the rate flow of heat into the element. All heat detectors have this thermal lag. Heat detectors have two main classifications of operation, "rate-of-rise" and "fixed temperature". The heat detector is used to help in the reduction of damaged property. It is triggered when temperature increases. ↑ Bartholomew, Robert (2018). "'Ballistic Missile Threat Inbound ... This is Not a Drill': The Formidable Threat of False Alarms". Skeptical Inquirer. Committee for Skeptical Inquiry. 42 (3): 5. ↑ Sampson, Rana; United States Department of Justice, Office of Community Oriented Policing Services (2007). False Burglar Alarms (Technical report). USDOJ. 2. 1 2 3 4 5 6 "False Alarm Prevention: The Cost and the Solution". ↑ "False Alarms: Keep Your Pet From Triggering Your Burglar Alarm". ↑ "False Burglar Alarms" (PDF). ↑ "A Prototype Multiview Approach for Reduction of False alarm rate in Network Intrusion Detection System" (PDF). p. 11. Archived from the original (PDF) on 2017-04-06. ↑ "Alarmingly Useless: The Case for Banning Car Alarms in New York City" (PDF). p. 8. Archived from the original (PDF) on 2012-12-07. ↑ Wang, Amy (January 13, 2018). "Hawaii officials say 'NO missile threat' amid emergency alerts". The Washington Post. Retrieved January 13, 2018.